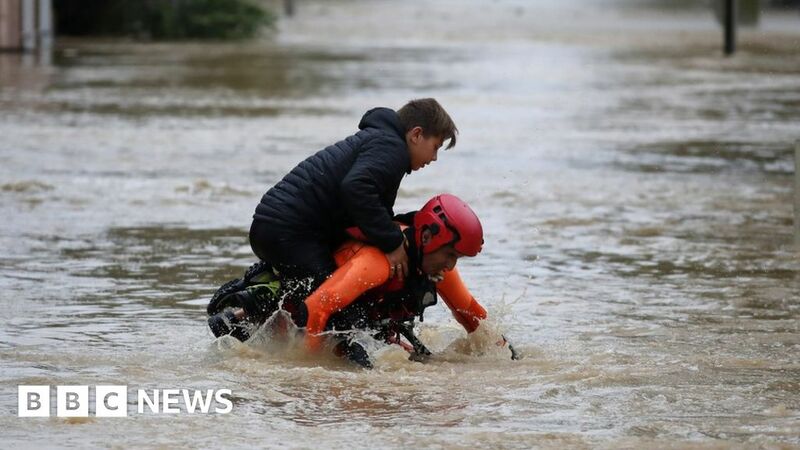 At least 13 people have been killed by flash floods in the Aude region of south-western France. Local authorities say several months’ worth of rain fell in just a few hours overnight, leaving roads blocked in some areas. A nun was swept away by the River Aude, local broadcaster BFMTV reports. Separately, a policeman attending to a weather-related traffic accident in the town of Albi was himself hit and killed by a motorist. Alain Thirion, the prefect of Aude, said people were stranded on rooftops and would have to be evacuated by air because it was too dangerous by boat. One person was injured, he added, when a house collapsed in the locality of Cuxac. The floods are the worst the Aude river has seen in more than 100 years, according to the weather monitoring service Vigicrues. Seven helicopters and 700 emergency service workers have been deployed, according to France’s Prime Minister Édouard Philippe, who says he will visit the area if conditions allow. The BBC’s Chris Bockman says heavy rain in the region is not uncommon at this time of year, but it has been exacerbated by growing numbers of homes being built on flood plains. Residents of the worst-hit areas have been urged to stay inside their homes by emergency services and local authorities, who have issued a red alert. In Trèbes, floodwater is as high as seven metres (23ft), local authorities say. Footage from the early hours of Monday shows the rising waters. All roads are inaccessible to the north of Carcassonne municipality and schools are shut, authorities say. A bridge was torn down and carried away by the force of the water in Villegailhenc. An amber warning for flooding has also been issued for the nearby regions of Aveyron, Haute-Garonne, Hérault, Pyrénées-Orientales and Tarn.